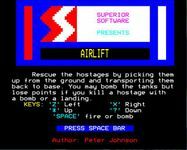 In Airlift, you control a helicopter trying to protect civilians from a tank moving across the screen. The tank will shoot buildings, destroying them, and releasing the civilians. The helicopter can land and pick up the civilians, taking them back to the landing pad.